The classic Spanish rice dish, paella, is the perfect weekend meal when you want something fancy, yet simple to prepare. 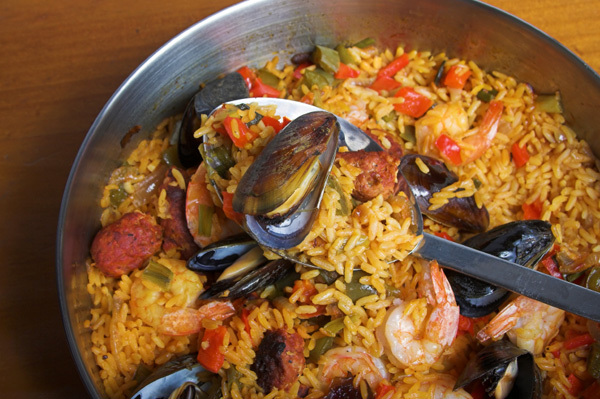 Paella can be made with just about any protein or vegetable, and it’s best when you mix and match to your own tastes. Here are tips to make this spicy Spanish dish and a paella recipe for you to make a dinner that is delicioso. The socarrat in paella is one of the most important keys for fabulous flavor. The socarrat is the crusty crispy bottom of the paella that becomes caramelized and toasted on the bottom of the pan when it is cooking. The crust on the bottom can be made in two ways. First, when the rice is almost finished cooking, take the pan with the paella off of the heat and let the rice absorb the remaining water. This will let the rest of the rice continue to cook while the heat from the bottom of the pan creates a crust. The second way to obtain the crust is to use a very high flame to cook the bottom of the rice. You must carefully watch the paella cook though because it can easily burn. After the bottom is crispy, the paella should then rest for a few minutes to set. No matter which method you use, you don’t want to stir the rice, you want to make sure there is one layer at the bottom that just stays there to cook. If you really want to get it right, purchase an authentic paella pan for the ultimate crust (price shop paella pans). If you don’t want the crispy crust at the bottom, no problem, just continue stirring so no part will become toasted – but be warned, your paella won’t have the flavor depth of one made with a socarrat. 1. Warm up 1/2 cup chicken broth in a small pot and gently stir in saffron and let soak for 15 minutes. In a separate pot, bring remaining broth to a simmer. Remove pot from heat and pour in saffron broth. Sprinkle with salt if desired. 2. Heat oil in a large skillet or heavy bottomed pan (cast iron works the best) until hot. Sear chicken on both sides until browned then move to a plate. Sauté 6 garlic cloves and peppers over medium heat in same skillet until tender, about 10 to 15 minutes thenmove garlic and peppers to plate with chicken and add artichokes and green beans to skillet. Cook until tender, about 10 minutes. Move artichokes and green beans to plate with chicken and add onions and tomatoes. Sprinkle with salt and cook tomatoes have mostly broken down. 3. Add last garlic clove and rice to skillet and cook, stirring continually for about 2 minutes. Spread rice out on bottom of the skillet and pour in hot broth, garbanzo beans, chicken and artichokes. Top with peppers and green beans. Cook mixture over medium high heat without stirring. Once rice is just about soft, reduce heat to medium low and cook, without stirring, until almost all of the liquid has been absorbed. 4. Cover the skillet and cook another 2 minutes, moving the pan while cooking. If the rice begins to burn, take pan off of heat. When crust has formed on bottom, take the pan off of the heat and let it rest for about 5 minutes. Serve paella directly from skillet. Note: This same recipe can be used but with different proteins and vegetables. Just substitute and cook in the same manner. Fish stock should be used for seafood paella or vegetable broth for vegetable paella. Duck, pork and sausage also work well as does tofu. Just be creative and try variations with clams, mussels, lobster, any fish, mushrooms, zucchini, carrots, squash, or other vegetables. Substitute vegetables for seasonality as well as spices.